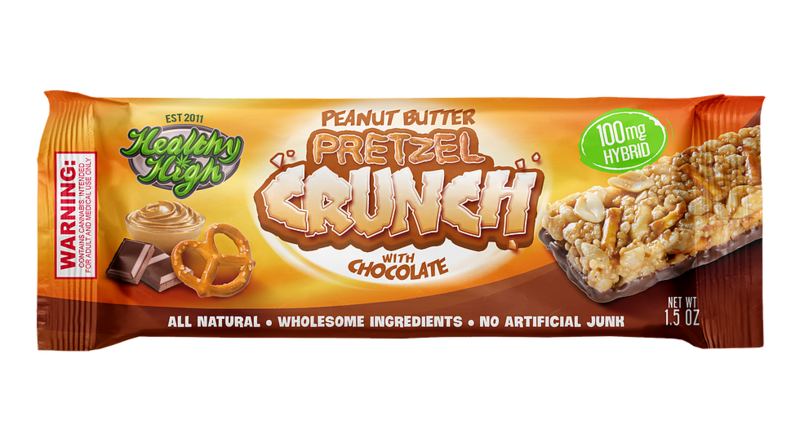 The Healthy High Peanut Butter Pretzel Crunch Bar is an incredibly delicious and perfectly balanced mix of crunchy and chewy goodness. Salted pretzels and peanuts mixed over crisped quinoa with sweet and salty peanut butter plus a rich layer of organic dark chocolate to seal the deal. Healthy High uses coconut oil in their full-plant extraction process to infuse potent medicine into their products in addition to healthy, nutritious fats with the incredible list of health benefits that coconut oil has become so famous for. Coconut oil’s saturated fat is made up mostly of medium-chain triglycerides, or MCTs. The medium-chain triglycerides in coconut oil can increase how many calories you burn. The bar might seem like granola at first but it’s actually Crisped Quinoa (pronounced KEEN-wah), which is a 7,000-year-old plant that originated in the mountainous regions of South America. While quinoa is commonly known as an “ancient grain,” it is technically not a grain or cereal grain, but a seed, and does not contain gluten. The Healthy High Crunch Bar is made using a completely tasteless Hybrid strain THC Distillate and is available in 100MG and 200MG THC dosings. The effect of this edible is a feeling of the nice and slow creeper variety that keeps coming along nice and steadily over the course of a few hours. The 200MG size bar lasted a total of around five hours for me and never got too intense or overwhelming and the taste was outstanding. This healthy treat is vegan and if it weren’t for the organic pretzel parts it would be gluten free too. I can’t recommend Healthy High enough, and the great natural taste, medicinal effects and health benefits make it an absolute favorite of mine. We had Healthy High on The Edibles Show on Z420.TV recently and were munching on the full line of bars throughout the program. Tangy and I got super medicated on the air and the fun kept going on for a few hours after the show had ended. I also ate one before a Swedish style massage at Wi Spa in Koreatown and it was a perfect combination. Nutritious, wholesome, real ingredients: THC Distillate, Crisped Rice, Crisped Quinoa, Natural Peanuts Butter, Peanuts, Pretzels, Coconut Oil, Brown Rice Syrup, Dried Cane Syrup, Dark Chocolate (Cocoa Butter, Dried Cane Syrup, Cocoa), Pure Vanilla, Sea Salt.